My lovely friend Amy, who I’ve known forever, recently me dropped a note on Facebook asking about Dutch ovens and whether I could make a recommendation for one. I can do better than that. I can make a resounding testamonial for one, then offer some more cost-conscious alternatives. As many home chefs will agree, Le Creuset makes amazing cookware that, at least in the case of the enameled cast iron versions, will last you a lifetime. I currently have two pieces, one large Dutch oven, in red (above) and one yellow grill pan, both of which were wedding gifts from dear friends when the Bun and I got hitched almost five years ago. When our friend Jenn saw my reaction to the Dutch oven, she was stunned. I think she said something like, “I thought I was just buying you a pot.” My reply was something like, “no, you bought us a cultural icon.” Where I am sure that in France, they would like the “culture” in that description to mean, “French,” I claim this cultural icon for all cooks, the world over, who love to prepare good food and share it with those they love. 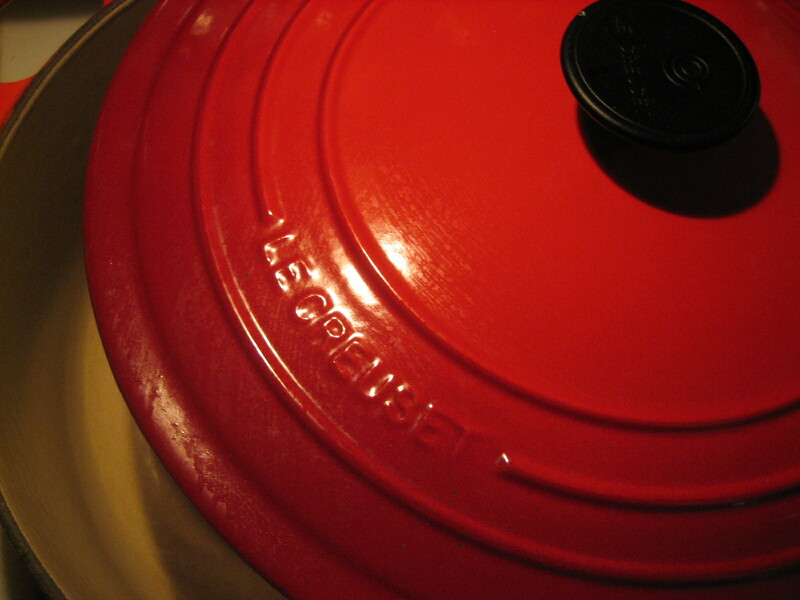 The problem with Le Creuset is that their products are often prohibitively expensive. Sure, they will last you a lifetime, and to calculate that cost over the course of decades (and decades beyond your death, should you bequeath your cookware appropriately), it makes sense, but the initial layout of cash can cause a fair amount of anxiety. If you know you are going to use it on a regular basis, I think it is absolutely worth saving up for a great piece of cookware. If you are unsure of how much you might use a Dutch oven, I say you should seek an alternative. It looks like both Giada De Laurentiis and Mario Batali offer enameled cast iron Dutch ovens at a fraction of the cost of Le Creuset. Giada’s are available exclusively through Target, and it looks like you can pick up the Batali versions through Crate and Barrel. Though I cannot personally attest to the quality of these items, I think they are worth trying out, at least as a trial for the form of the Dutch oven. The other alternative I offer up is finding, inheriting, or creating a seasoned, non-enameled cast iron pan with a lid. Though I have never seasoned cast iron myself (I am lucky to have inherited my grandmother’s cast iron Dutch oven, though it is lid-less), I think there are several good resources on the subject. Alton Brown, I believe, had an entire program devoted to the practice of seasoning cast iron, so a review of the Food Network archives might be a good place to start. Regardless of what you end up with, start with making something basic and familiar in your Dutch oven on the first use. You’ll want to test it for hot spots, time to heat, and other factors. This is always best done with familiar ingredients; you at least want to know how the ingredients are going to behave, right? Once you start working with a Dutch oven, you’ll find so many ways to use it. I make almost all large-quantity soups in mine, as well as most braises. It is also what I fry chicken in, if doing more than one bird at a time. So, hit the store this weekend and get cooking – invite some friends over for Sunday supper and show off your rediscovered skills. With a nip still in the air, everyone will appreciate a little comfort in their bellies.